The developers of DVD-Ranger yesterday released 5 new database files for their Cinavia Blu-ray copy protection removal software CinEx HD. The databases contain information that assist CinEx HD in removing the Cinavia Blu-ray audio watermark from the movies, making it possible to make a backup. So far, DVD-Ranger CinEx HD is the only software able to actually remove the Cinavia copy protection from movies. Other software is able to block detection of Cinavia, but the DVD-Ranger developers claim to have found a way to remove the Cinavia audio watermark from movies. The benefit is that a copy of a movie with Cinavia removed by DVD-Ranger can be played on any device, just like a regular movie. 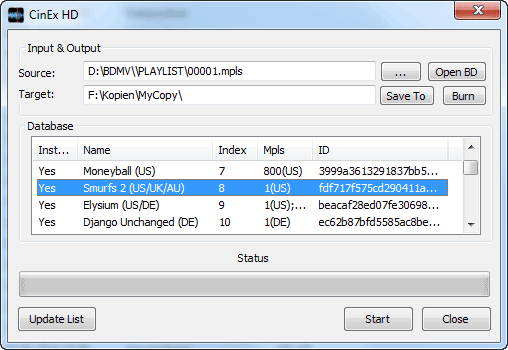 Other solutions so far only work with a selected amount of Blu-ray playback software. How the Cinavia removal process of DVD-Ranger works remains a mystery. In order to remove Cinavia with CinEx HD, users are required to download a database from the DVD-Ranger website. These databases contain a so called ‘first pass’. According to the developers this first pass is the first step in the process of Cinavia removal. Without the databases it would take hours on a regular system to remove Cinavia. By using the database, the Cinavia removal is faster for the end user, the developers claim.